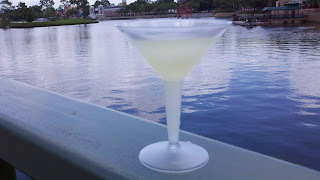 There are a few things I always need to consume while visiting Disney World. One beverage that makes the cut is the Grey Goose Citron Lemon Slush from a champagne kiosk in the France Pavilion in Epcot. It sits at water’s edge directly across from Les Chefs de France. I will forgo this drink for a warmer option on a chilly day, but on those sultry summer evenings, there is nothing finer. The name says it all; made from Grey Goose vodka, the lemonade is frozen, sweet and tastes like summertime! You will regularly see me savoring one of these as I amble towards Morocco! At this same kiosk, there are offerings of wine and champagne as well as the Citron slush’s equally popular Grand Marnier Orange slush. So whichever your preference, you can’t go wrong cooling off in France!